The Glacial Ridge Trail offers something for everyone, whether their interests are historical, cultural, recreational or a simple scenic drive. The Glacial Ridge Trail offers access to West Central Minnesota’s abundant natural resources, recreational opportunities, historical and cultural character, all while offering modern, convenient travel accommodations. Join us for a unique and exciting dining experience. Watch as your favorite food is prepared on our charcoal grill in the dining room. Since 1965, the Minnewaska House has been an historical landmark on the Glacial Ridge Trail Scenic Byway. Located midway between Glenwood and Starbuck on State Highway 28, the building overlooks Lake Minnewaska. Open Wednesday - Saturday from 4:30 pm - 1:00 a.m. The Bakery is open Monday through Friday from 5:30 a.m. - 5:30 p.m. and on Saturdays from 5:30 a.m. - 5:00 p.m.
Open seven days a week 11:00 a.m. to 6:00 p.m . Located in the beautiful lakes area of Central Minnesota, Carlos Creek Winery is the largest, most advanced fine wine producer in the state. The winery offers wine tasting, guided tours and live music on the wine patio every weekend. Walk around our permanent maze or orchard full of 8,000 apple trees. Country home rentals - perfect for family reunions, retreats, conferences/training. Historic country home, front/back porches, sunken patio, 3-baths/jacuzzi. Bird watching, pond, volleyball, horseshoes, fire pit, and a 2 story social center with bumper pool, foosball, darts, karaoke, piano/organ, parlor and yard games. Fishing, boating, canoeing, nature trails, golf courses, antiques, gift shoppes within minutes of the site. 6 campsites for guest only. You are invited to become part of “discovering, preserving, and disseminating the history of Douglas County”! 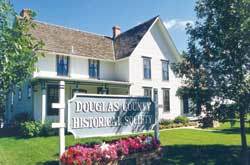 The Douglas County Historical Society is headquartered in the residence of the only foreign born Governor of Minnesota, Knute Nelson. The turn of the century house has been completely restored, with many of the original furnishings intact. The inn is a simple prairie style 1800s farmhouse. There are four lovely rooms with private and shared bathroom options. Good coffee with a tantalizing breakfast. Picnic lunches are available as are gourmet dinners or lunches upon requet. Produce features honey made by bees on property, medicinal and culinary herbs grown organically, and apples. Other products include handmade soaps and beeswax candles, as well as gift baskets and packages. Tours for small groups can be arranged. Open almost always by chance, appointment or for self–serve. Five miles north of Benson off Highway 29. Watch for signs. Providing fine Scandinavian delights since 1994. During September thru December we do numerous arts and crafts shows throughout the State of Minnesota. Most notably the Noisk Hoist Festival in Minot, North Dakota, the largest Scandinavian festival in the U.S. Our customers include Super Value, Country Markets and Bob’s Produce Ranch. We have listed a few of our favorite attractions below. Additional attractions and places to stay can be found at www.willmarlakesarea.com or by calling the Willmar Lakes Area Convention & Visitor Bureau at 800-845-8747 or email info@willmarlakesarea.com. Need Directions? This precious pocket of talent is one of the area's finest live performing arts theatres and developing regional art center. They offer several different productions each year. Need Directions? Gather your craft beer friends and stop in to enjoy an amazing handcrafted brew fresh from the tap! Glacial Ridge Winery is located on Hwy 23 just 15 minutes North of Willmar, MN between Spicer, MN and New London, MN. There are many lakes and recreational areas in our back yard which, together with a visit to our Winery, could make for a wonderful weekend away from the city. The Glacial Ridge Winery hosts a variety of special events throughout the year. Some of our most popular include; The Summer Concert Series, Grape Stomp and Parties in the Pavilion. Need Directions? Enjoy the spirt of a small-town watering hole while savoring their specialty brews. Need directions? This museum features exhibits devoted to Kandiyohi County history including early transportation, Indian artifacts, immigration, and a variety of other exhibits. The museum is the home to the Great Northern Steam Engine No. 2523 which was built in 1916 to speed up the passenger main line service through the mountains. Also, located on the museum site is the Sperry House. The house was built in 1893 and displays turn of the century home life in Kandiyohi County. We have an art gallery on the second floor and novelty items for sale in our main showroom. Need directions? This award winning ski team performs their spectacular show every Friday evening during the summer months at Neer Park in New London. Need directions? Long Lake Antiques is an antique store like no other in Central Minnesota. We are located in Willmar, Minnesota and are proud to have an inventory of over 10,000 items. With items coming and going all the time be sure and check with us often. Better yet come and visit. You'll find art, books, metal, clothing, ceramics, glassware, jewelry, lamps, toys and much more.We're near beautiful Long Lake just north of Willmar in the heart of Minnesota. If you can't come here then check out our online store. Tuesday thruough Sunday 10:00 am - 5:00 pmWe are closed on Monday's and National Holidays. Prairie Woods is a nonprofit environmental learning center, committed to providing outstanding environmental education and outdoor experiences to people of all ages. Deeply rooted in our Kandiyohi County community, we reach out to provide services for communities across Minnesota and the upper Midwest. Our learning center encompasses 500 acres, and includes an education building with 5 classrooms, a trailhead, challenge course and a 30-foot indoor climbing wall. The Gary Westby Observatory building sits atop Prairie Wood's highest hill. Several beautiful spaces are available for meetings, family reunions, holiday gatherings, and weddings. Also onsite are a Native American History Village and Gary Westby Educational Shooting Sports Range. Need directions? 54 Year Collection of tractors, cars, trucks, gas engines, gas pumps, signs and more! Over 400 units on display! Pedal cars, pedal tractors, signs, tractor books and much more. Opens on the third Saturday in May every year (same day as Willmar's annual car show). Hours are 1 - 4 pm; Monday through Saturday. Also open by appointment for group of 20 or more. Need Directions? There is something for everyone at this popular west-central Minnesota State Park. Hike to Mount Tom, one of several high points in a 50-mile radius, and see a patchwork of forest, farmland, prairie knolls, and lakes. Summer visitors enjoy swimming, boating, and fishing on Lake Andrew. A canoe route invites adventurers to portage and canoe on Henschien Lake and Swan Lake. The park offers campgrounds, a modern group center, horseback camps, picnic area, and interpretive programs year-around. The Glacial Ridge Trail Scenic Byway thanks the County Board of Commissioners in Douglas, Kandiyohi, Pope and Swift Counties and the Sauk Center Visitors Bureau, Willmar Lakes Area Convention & Visitors Bureau and the Alexandria Hotel & Hospitality Association for their continued and generous support for the activities of the Glacial Ridge Trail Scenic Byway.